098. 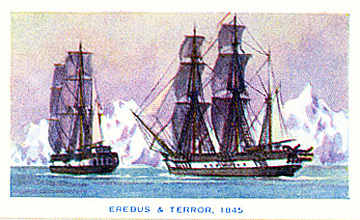 EREBUS & TERROR, 1845. Issued by R. & J. Hill Ltd. (1940). Card number 8 in a set of 50 entitled "Famous Ships". Size: Ca. 2.1" x 1.5". Note: There are varnished and mat versions. Verso: FAMOUS | SHIPS | No. 8 | "EREBUS & TERROR." | The names Erebus and Terror are bound up with the history of the exploration of Antarctica. Erebus is a volcano, and Terror another volcanic peak: both were discovered by Captain James Ross in 1841, and named after his ships. The craft shown in this picture were used in another British Expedition, which sailed from the Thames on May 19th, 1845, to explore the N.W. Passage.